How can you improve your cobot’s performance? What are the best metrics to use? This new eBook is the essential guide! Perhaps you’ve been using your robot for a while, or perhaps you are just getting started. The robot isn’t delivering the performance you expected. You suspect that you can improve its performance, but where do you start? If you’re not a robotics expert, it’s hard to know. You worry that your integration might be the problem — what if the robot wasn’t integrated properly in the first place!? You fear that you chose the wrong technology — what if collaborative robots don’t live up to their promises? You are concerned by the lack of robotics expertise in your team — what if you have to call up the integrators for every little change? That could get expensive! How well is my robot really performing? Without reliable data, it’s hard to tell how good a robot’s performance really is. Some users are tempted to just “set it and forget it” with their cobot applications, especially if they have used industrial robots in the past where this is often the only option. If they see low production figures from the robot cell, they worry that it might have been a bad choice. 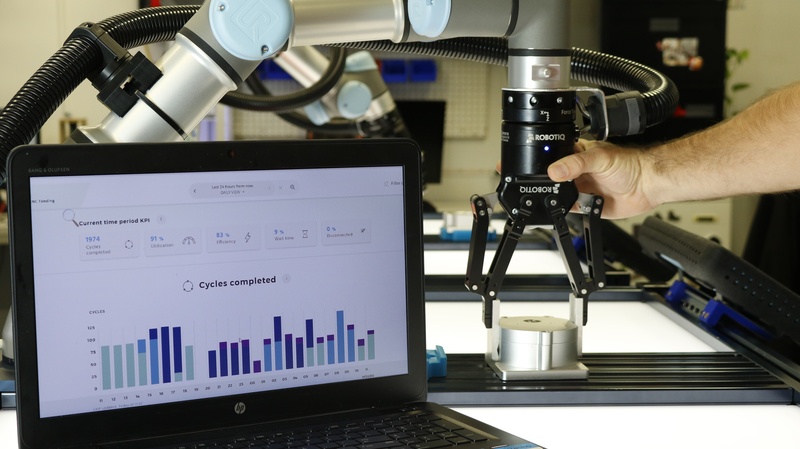 One huge benefit of cobots is that you can tweak and optimize their programming over time. This makes it easy to boost productivity, iron out problems and adapt to changes in the process. However, you need data to be able to make these changes effectively. Key Performance Indicators (KPIs) are essential for monitoring your robot. But I already measure KPIs in my business! Yes, you probably use several KPIs to measure the performance of your business. For example, Overall Equipment Effectiveness (OEE) is kind of the “gold standard” KPI for manufacturing businesses. It integrates the performance, availability and quality of a machine. Many businesses use it to measure the performance of almost every type of manufacturing equipment, from CNC machines to packing machines. Surely you can use OEE to monitor cobots as well? You can, but it’s not the most helpful KPI when it comes to robotics. While OEE and other metrics are useful for monitoring the running of your entire process, they are not specific enough to help you improve the performance of a collaborative robot cell. Such metrics may indicate that the robot cell needs to be optimized, but they won’t give you many clues about how to achieve that optimization. Remember, not all metrics are equal. You don’t just need any old KPI. You need cobot-specific KPIs. Cobot-specific KPIs are targeted at the performance that really matters for a collaborative robot cell. They help you to identify which aspects of the robot’s operation need to be improved and provide clues as to how you can achieve this improvement. Cobot analytics help you to monitor and analyze your collaborative robot using simple, clear metrics. But, which metrics are best for collaborative robots? How do you measure them? What’s the best way to analyze the results? If only there were a simple guide to collaborative robot KPIs! In our new eBook: “Analytics for Cobots” we introduce the five most important KPIs for your collaborative robot. We have devised them based on the last decade of experience working with robot users in a wide variety of industries and have found them to be the most useful for improving a collaborative robot setup. This simple, step by step guide provides the essential information so that you can start using metrics with your cobot immediately. It gives you a practical introduction to the five KPIs, along with a load of additional tips and tricks for making them work for your application. Why Not All KPIs are Equal. If you have ever wondered how to get better performance from a collaborative robot cell, this eBook is for you!